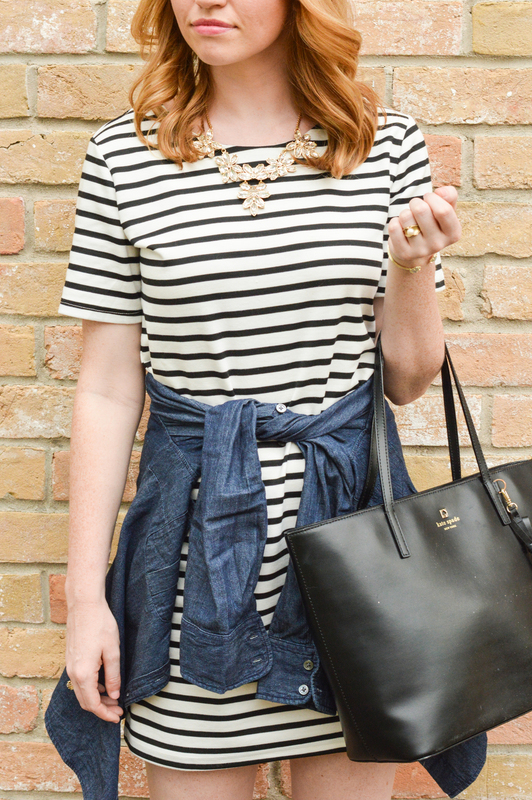 Stripes + Denim + BaubleBar Giveaway! 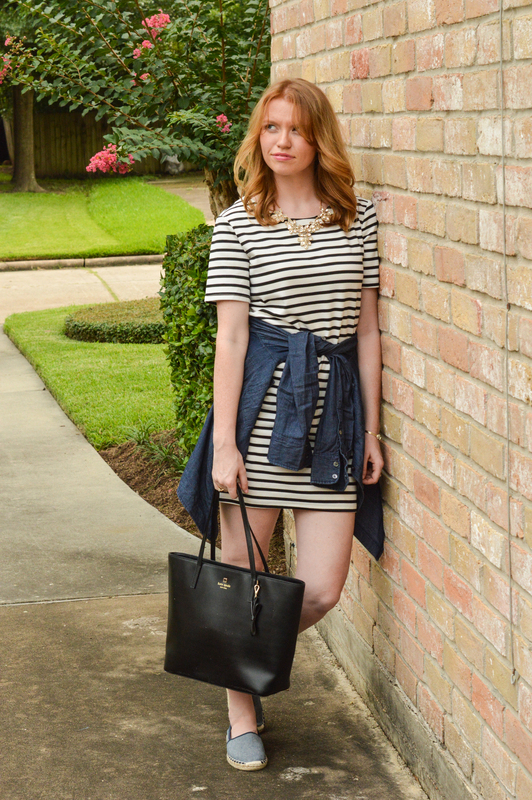 I've always been a fan of the casual, yet dressed up summer dress. So when I stumbled across this dress from Necessary Clothing last summer, I was itching to buy it and ended up purchasing for $25. As I've said before, one of the main times I go shopping is when things are on major sale (PS, get ready because brands are starting sales even now!) because I can get more bang for my buck. This outfit was no exception. The tote is kind of a funny story. My mom and I were out shopping this past Black Friday (something we never do) and we decided to walk through the new Kate Spade outlet at the mall. As we walk in, both my mom's and my eyes are drawn to this tote, which was marked down originally in addition to the whole store being 60% off. I looked at my mom and told her if we wait even a week, they'll be gone. So we both bought one (our Christmas presents to each other, which we did wrap up and open at Christmas) and came out spending a total around $250. Normally the price of ONE tote, plus some more. This necklace came via Rocksbox (sign up using code everydayelegancexoxo and get one month free! ), and is from Perry Street. Originally $70, I knew I couldn't justify spending that much money on it, but with shine spend, I managed to get it down to $30! The denim shirt was a Christmas Present from my Aunt, uncle + cousins. All in all, it's a pretty frugal outfit! 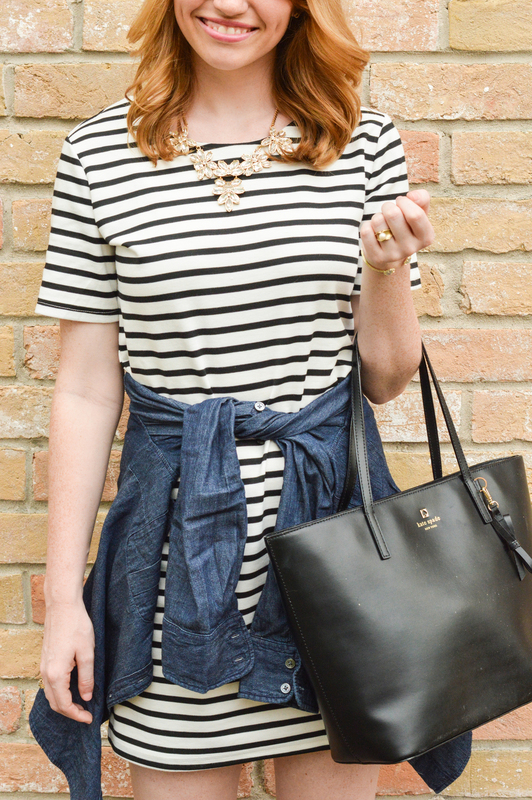 While normally I don't spend that much on a tote bag or a necklace, all of the items I'm wearing in this post are pieces that I will keep and will last for a long while! When you stock your closet up with basic pieces that can be put together different ways, you'll never run out of new outfits to try! 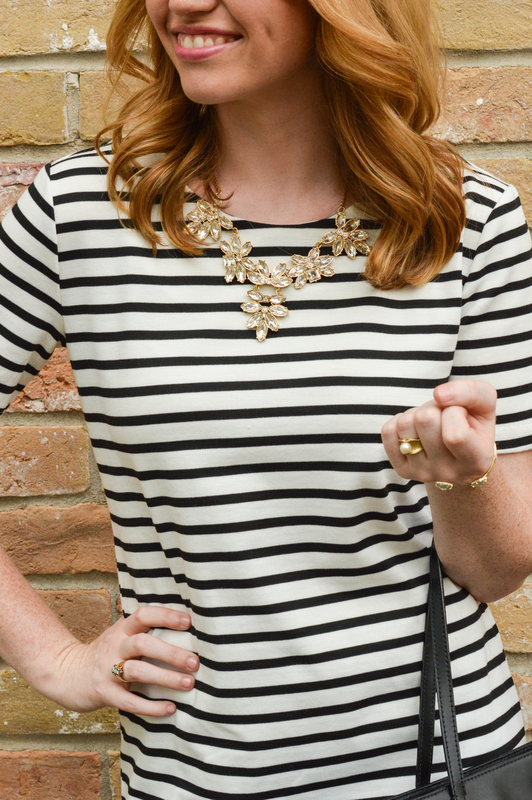 On to some exciting things, like a Baublebar Giveaway! Baublebar is one of my favorite jewelry sites, with fun trendy pieces at reasonable prices. Well, I've teamed up with some awesome ladies to make this site a little more affordable! I actually just purchased this beautiful necklace and have been impatiently waiting for it to arrive! Enter using the rafflecopter widget below to win a $25 gift card to Baublebar! Here are some of my picks!